Bartholomew Bruyn the Younger was one of Cologne’s leading portrait painters of his time. He completed a number of such paintings for the city’s upper class. 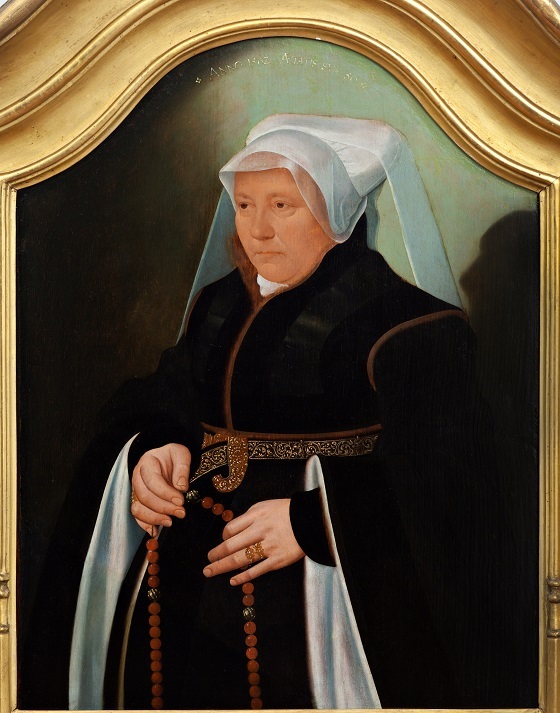 This three-quarter length portrait of a middle-aged burgher wife typifies the artist’s conservative style and realistic approach to his models. The burgher wife is portrayed against a simple, dark background, wearing only a few albeit costly garments underlining her status and wealth – a leather-edged dress with white lining and a golden belt adorned with rich ornamentation and figures in relief. In Bruyn’s portraits, the model’s hands often play an important role in displaying symbolic objects. Between her fingers, the wife holds a rosary of green and red beads. In addition to drawing the mind to meditate on the so-called Mysteries of the Rosary, the rosary here also symbolises the wife’s devotion to the Christian faith and teachings.